The Verge: A textbook created by Artificial Intelligence turned out to be better than ordinary textbooks. The academic publishing house Springer Nature presented the first research book created using machine learning. Reported by The Verge. 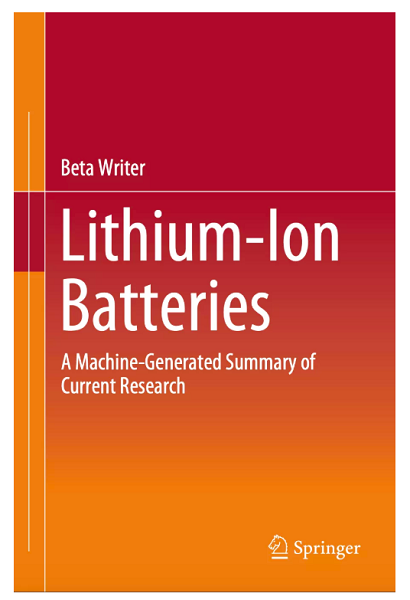 The book "Lithium-Ion Batteries: A Machine-Generated Summary of Current Research" contains a summary of peer-reviewed articles published on this topic, including citations, hyperlinks and automatically generated links to the content. The tutorial is available for free download. In his opening remarks, Henning Schoenenberger of Springer Nature said that such books are capable of starting "a new era in scientific publications, automating routine work." Schoenberger notes that in the last three years alone more than 53,000 scientific papers on lithium-ion batteries have been published. This is a huge problem for scientists who are trying to keep abreast of developments. But using AI to automatically scan and summarize these results, scientists can save time and continue important research. "This method allows readers to speed up the process of mastering the literature in this field of research. At the same time, if necessary, readers can always identify the source and go to it for further study of the subject," said Schönenberger. Although the recent boom in machine learning has greatly improved the ability of computers to generate the written word, the performance of these bots is still very limited. They cannot struggle with the long-term consistency and structure that human writers create, and therefore such efforts as fiction or poetry generated by AI are more likely to be formatted. What an AI can do is compose formula texts when loading a library. For example, in journalism, machine learning is used by organizations such as The Associated Press to create reports of football matches, earthquakes, and financial news. These are topics where creativity is an obstacle. According to associate professor at the Institute of Human Computer Interaction Jeff Bigham, the book was not the most impressive feat of AI. “It’s enough just to take a high-quality introductory text, briefly summarize the main conclusions and make the material look connected. In fact, the very nature of the extract means that it will be consistent in parts if the input texts are coherent. would call it valuable, "commented Bigham. Earlier, InternetUA has already reported on AI journalism: the world's largest media uses robot authors to create articles. Moreover, AI journalists are already writing fake news - computers that have already been used to create short news reports from press releases can be taught to read and write long false texts.